Cool Site > Let's explore the world! 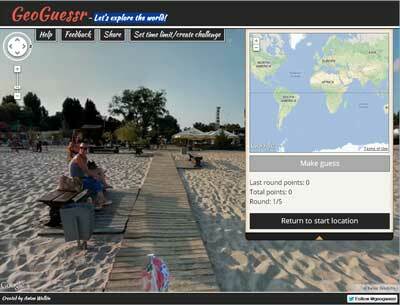 GeoGuessr is a browser-based game that drops you into a randomly-selected location, courtesy of Google Earth's Street View, and then asks you to guess your location by dropping a pin on a world map. With each guess, you rack up points based on how close you came to the location depicted. At the end of the game, you can share your score and invite others challenge your score. Test your intuition and powers of deduction with this fun and innovative website today!